Do vegetables often take a back seat to the main dish you serve for your dinners? Lately, I have been spending more time thinking about ways to jazz up the vegetables I serve. Vegetables are available in abundance at my house with my garden producing at peak rates these past couple of weeks. With fresh green beans in generous supply, we are happily eating them several times a week. 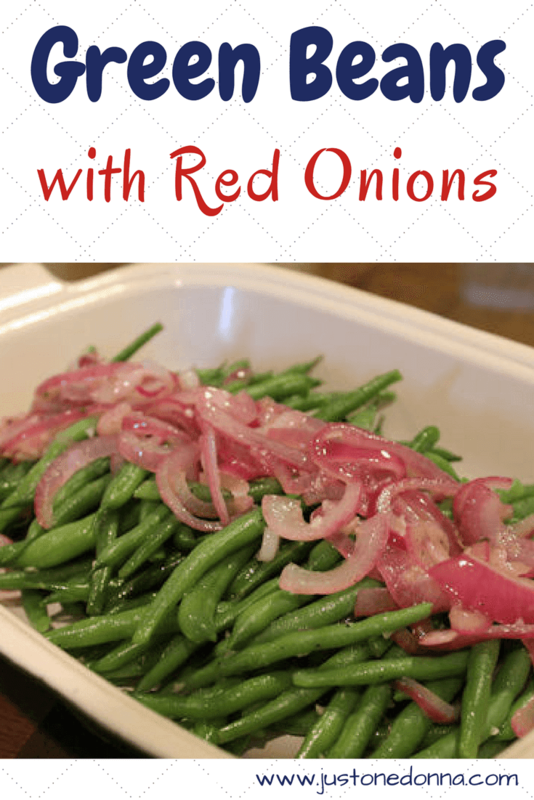 Green beans are one of our favorite vegetables. We like them steamed crisp with just a little salt, pepper, and butter. Most of the time that is exactly how we eat them. When I want my beans to have a little more flavor, this recipe takes the simple green bean's flavor up a notch or two. As a bonus, it is easy enough to make for a weeknight dinner while being flavorful and attractive enough to serve to guests. 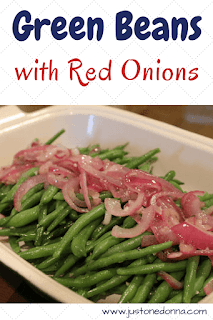 These green beans make a perfect summer side dish because you can serve them either warm or at room temperature. You might want to save this recipe for a Christmas side dish, too. The colors in this dish will look festive on your Christmas table. I like to add a side dishes like this to my holiday menu to offset the richness of some of the other holiday dinner favorites. Your guests who are watching calories will thank you. Bring a pot of salted water to a boil over medium-high heat. Add the green beans. Cover the pot and bring the beans to a boil. Cook for 3 minutes. Drain the beans and pour them into a bowl of ice water to stop the cooking process. This will cool the beans and retain the bright green color. Drain and set aside. Heat two tablespoons of olive oil in a large skillet over medium heat. Add the sliced onion and garlic, stirring to combine. Season with salt and pepper. Cook for 1-2 minutes until the onions start to soften. Be careful not to brown the garlic. Add the beans to the pan, tossing to coat with the oil, garlic, and onions. Add the red wine vinegar and stir to coat. Cook until the beans are warmed through, about 2-3 minutes.